This is a jewel book for Greek Literature; a rare, diachronic, deeply philosophical piece of work with pioneering analyses of poems of Greek poets. Dimitris Kakalidis approaches, with respect and without any critical attitude, each poem; he discovers its sensitivities, its messages and at the same time he reveals its hidden essence. It is a work that opens “new, unprecedented paths in analyzing poems”, as mentioned by people of the letters and arts in Greece. 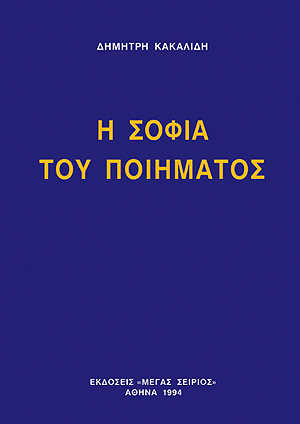 This is the first volume consisting of analyses of 52 poems by renowned contemporary greek poets. You can order the second volume here.